ModelMM716 Min.Order1000 Brief DescriptionStainless steel handles 15mm profile are available in all lengths. Stainless steel ensures sustainability. Handle's length Available in all lengths. hole distance Available in all lengths. Manda metal, with its headquarters in China, offers German, Austrian and European buyers and businesses the best quality and highest reliability at Chinese prices at the moment.The company is a 100% WFOE (Wholly Foreign Owned Enterprise) and thus fully owned by its German management. MANDA METAL employs more than 70 employees working on 4,000 m² production area. Steady expansion of our production, continuous training of our employees and our DIN EN ISO 9001 certification guarantees high-quality fittings for the furniture industry as well as superior and refined machining parts according to German quality standards.Product Range:Turned parts:We offer steel,stainless steel,brass,Alu material product processing with brush,polish,punch, turning,grinding and all kinds of surface treatment.Handle:Produce handle with zinc,steel,stainless steel,Alu material. 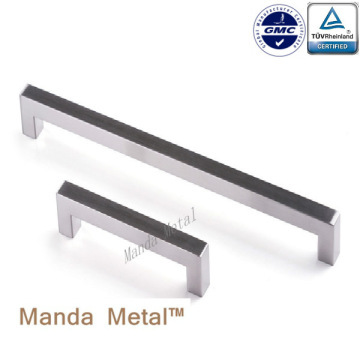 Manda metal, with its headquarters in China, offers German, Austrian and European buyers and businesses the best quality and highest reliability at Chinese prices at the moment.The company is a 100% WFOE (Wholly Foreign Owned Enterprise) and thus fully owned by its German management. MANDA METAL employs more than 70 employees working on 4,000 m² production area. Steady expansion of our production, continuous training of our employees and our DIN EN ISO 9001 certification guarantees high-quality fittings for the furniture industry as well as superior and refined machining parts according to German quality standards.